Are you looking for the most reliable and professional industrial electrician Portsmouth has to offer? Look no further than Taylor Durant. 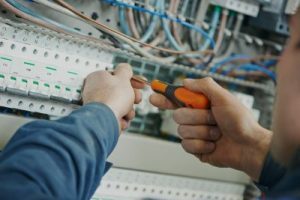 We’ve been providing our first class electrical services to the industrial, commercial and corporate markets since 1978, and strive to maintain our reputation for high-quality and professionalism. Call our helpful team on 023 9266 8586 to find out more about our electrical services today. To find out more about the most reliable industrial electrician Portsmouth has to offer, contact our helpful and professional team today. 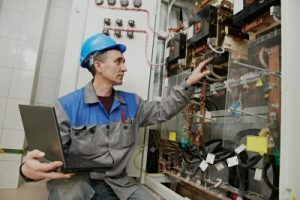 Maintaining your electrical installation is a must to ensure your business runs as smoothly as possible, and that you comply with the Electricity at Work Act. Should an electrical emergency occur, our highly trained and experienced electricians will aim to get to you as soon as possible to get you up and running again. As the best industrial electrician in Portsmouth, we don’t charge our clients for call out fees, and you’ll only pay for the time it takes to resolve any issues you may have. To find out more about our commercial electrical services, contact our helpful and professional team today. At Taylor Durant, we manufacture a range of electrical control products, such as small control panels, wall mounted control panels and larger floor standing suites. Produced by trained personnel who are qualified to 17th Edition and 2391 test and inspection, you can trust that we offer only the highest-quality control panels. This is in addition to our strict testing policies to ensure your product is free from defects or faults when delivered, and a fast track panel build manufacture. To find out more about our control panel service, contact our helpful and professional industrial electrician in Portsmouth today. To ensure your business is running as smoothly and efficiently as possible, our highly-experienced team of technicians offer a complete preventative maintenance service. With experience managing several large industrial installations, and contracts ranging from maintaining emergency lighting to complex process control environments, no service project is too big or small for Taylor Durant. To find out more about our preventative maintenance service, contact our helpful and professional industrial electrician in Portsmouth today. With over thirty-five years’ experience, you won’t find a higher-quality access controls service than at Taylor Durant. We supply high-security card and fob entry solutions to suit your requirements and budget, so contact our helpful and professional industrial electrician in Portsmouth today. We understand how vital safeguarding your property and possessions are. That’s why we can offer our customers a wide range of fire alarm installations across the south. Perfect for offices, warehouses, residential homes, leisure facilities and more, our professional and helpful team can help with all of your fire alarm needs. Are you having problems with traffic flow in your business? Or would just like to find out more about how to install them on your premises? With over thirty-five years of experience, we can supply, install and service your barriers, as well as recommend the best maintenance methods. Our barriers are manufactured by FAAC Simply Automatic, the leading designer and manufacturer of access automation systems, meaning you’ll receive only the highest quality barriers. To find out more about our barriers, contact our professional and helpful Portsmouth industrial electrician team today. With over thirty-five years of experience providing exceptional electrical services to many happy customers, it’s unsurprising the majority of our work is from returning customers and recommendations. Catering to the industrial, commercial and corporate market, no project or task is too big or small for our highly talented Portsmouth industrial electrician team. Do you still need convincing that Taylor Durant is the most reliable and professional industrial electrician Portsmouth has to offer? If so, have a look through our gallery to see some of our previously completed high-quality work. To contact the most reliable and professional industrial electrician Portsmouth has to offer, call us on 023 9266 8586 today. Alternatively, you can email us at enquiries@taylordurant.co.uk or fill out our simple online enquiry form, and we’ll get back to you as soon as possible.